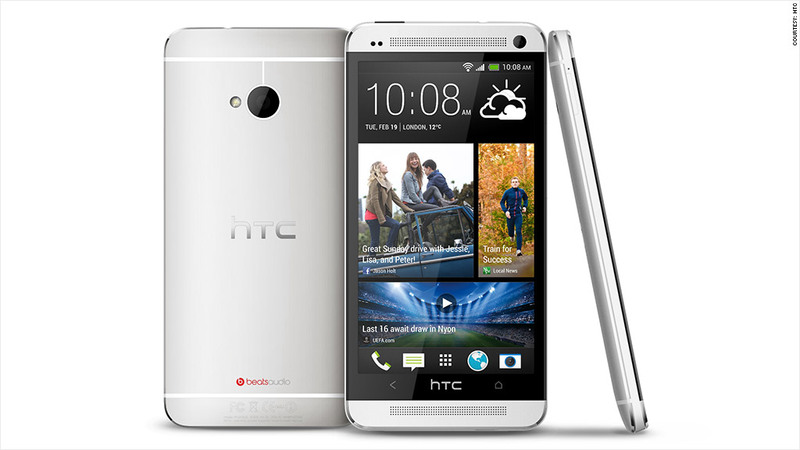 The new HTC One smartphone, unveiled Tuesday in New York, is equipped to compete with the best smartphone offerings from Apple (AAPL), LG, Nokia (NOK), and Samsung (SSNLF). The 4.7-inch phone is cased with mix of aluminum and polycarbonate, employing a design that's as attractive and well-constructed as any other phone currently available. HTC's device is thin and light, and the screen is plenty big -- but not so big that it's difficult to wield with one hand. The HTC One also introduces a handful of new media-centric features, including better speakers, an infrared remote control, and a completely redesigned camera sensor. The HTC One camera only snaps four-megapixel images, but HTC says it has increased the physical size of those pixels—and dubbed them "ultrapixels," which will supposedly give it an image quality on par with an eight-megapixel sensor. Another feature to go with the improved camera is the "HTC Zoe." The tool will allow users to shoot short burst video clips, and then the HTC One's software will automatically cobble it into a video that you can share with friends and family. It seems like more gimmick than essential feature. But the biggest leap over previous HTC offerings is not the bump in specs or even the updated design. It's the reimagining of Sense, HTC's custom Android user interface. With the new Sense, HTC borrowed a page from Microsoft's (MSFT) Windows Phone and developed a tiled interface called BlinkFeed. The new UI dynamically pulls content from social networks, calendars and 1,400 media outlets including the AP, ESPN, Flickr, the Financial Times, and MTV, which users can curate to reflect their specific interests. Previously, Sense had been more focused on organizing contacts and delivering notifications, such as calls, texts, emails, and events. News and social media integration was very much a secondary concern, but now those priorities have been reversed: Content is king. For the few minutes I played with the Sense UI, I found it to be smooth, responsive and well-designed. Occasionally some of the tile elements or the browser showed signs of lag, but that didn't make the experience unpleasant. It would have been nice, however, to see Sense integrate information from apps and notifications, even if they aren't the primary focus of the new UI. Sure, you can add items to your calendar, and Facebook (FB) and Twitter. But missed calls and new emails did not appear to live in HTC's BlinkFeed. All of HTC's changes should make its new phone competitive with all the other new Android phones to hit the market this year. But there is one thing that could hold it back. Ironically, it's the HTC One's biggest selling point, the Sense UI. Any custom Android interface "skin," no matter how unobtrusive, means that a device can't receive the latest updates as soon as they're available -- Google's Android update has to be configured to work with the custom UI. In fact, it's already behind: The HTC One is not running the latest build of Android (4.2), but a version released earlier in 2012 (4.1). There's not a huge difference between the versions now, but generally speaking Android updates bring plenty of new features and functionality. Skinned Android phones might not see an update for months (or maybe even years). This may or may not come back to haunt the HTC One, but for now, it's a phone to keep an eye on in 2013. The HTC one will be available in late-March on AT&T (T), T-Mobile and Sprint (S). It will come in 32- and 64 gigabyte varieties. Pricing, however, is still a mystery.